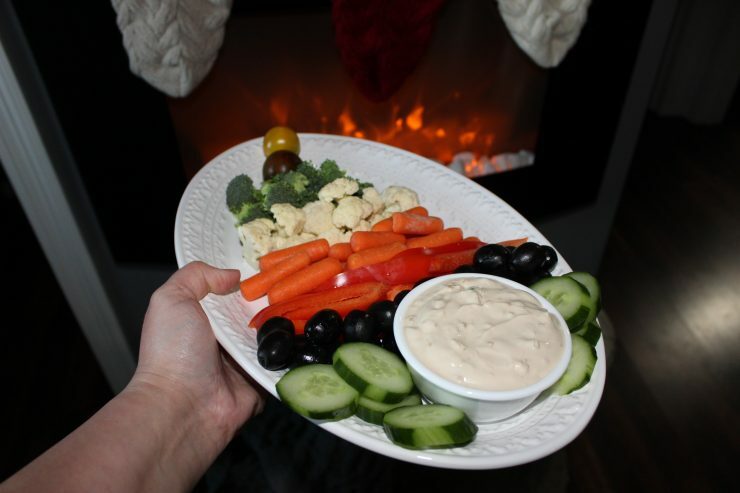 I couldn’t write a post for Christmas without including my signature Christmas Vegetable Tray with French Onion Dip! Every year for Christmas Eve, a Christmas Vegetable Tray was my contribution to the culinary festivities at Granny’s house. I developed an interest in cooking around the age of 9 or 10 but wasn’t interested enough to actually cook or bake anything. Knowing of my desire to contribute something, Granny suggested that I make the vegetable tray for Christmas Eve one year. 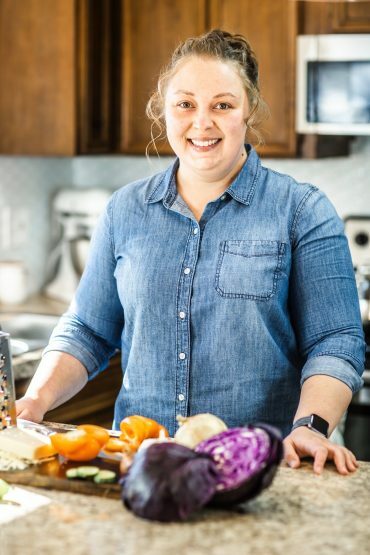 I was overjoyed at a chance to “cook” and bring a food dish just like all of the adults and spent a good bit of time at the grocery store meticulously selecting the vegetables I wanted to include. If I remember correctly, my first Christmas Vegetable Tray had a few odd items such as pickles and corn on the cob. haha! Over the years my style and taste in Vegetable Trays evolved and refined to eliminate the pickles and corn cobs but the tradition of making the Vegetable Tray each year held strong. Even though I’m not able to spend every Christmas Eve with Granny like I used to, I still make a Christmas Vegetable Tray with French Onion Dip every single Christmas Eve. Not a fan of French Onion Dip? Don’t worry because I’ve got you covered too! This wonderful Homemade Ranch Dressing recipe is super easy and makes a wonderful vegetable dip! 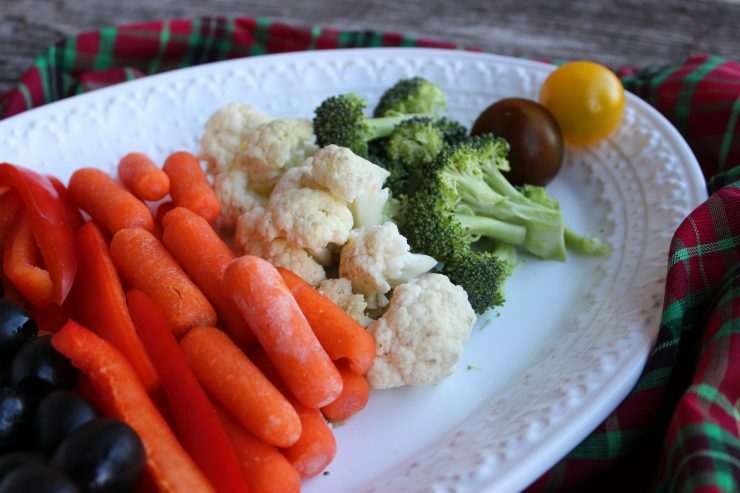 Making a beautiful and festive Christmas Vegetable Tray is so simple and easy! Honestly, anybody can do it, so if you’ve got kiddos that want to help out in the kitchen, let them make the Vegetable Tray this year! While you don’t have to use the same vegetables I did for my tray, I do recommend you use a variety of different vegetables. Remember, you want your Christmas Tree Vegetable Tray to be colorful and appealing to the eye so stay away from using all one color of veggies. Some great vegetables to use for a vegetable tray include: cherry tomatoes, cucumbers, carrots, bell pepper, cauliflower, broccoli, edamame, celery, olives, and red cabbage. You could also include radishes and sugar snap peas for some colorful options. Whatever you choose to add to your vegetable tray, make it colorful and fabulous! I used these beautiful, sweet cherry tomatoes for the “Star” on my Christmas Tree Vegetable Tray. These tomatoes are colorful, juicy, and delicious! As you can see, I init ally started out using 4 cherry tomatoes to create the “tree” topper, but then later reduced it to only 2. I felt like just using 2 made the top of the “tree” look more realistic and Christmas-tree-like. After creating the vegetable tree topper, add a small amount of broccoli florets (about 1/2 cup) in a horizontal line below the vertically placed tomatoes. 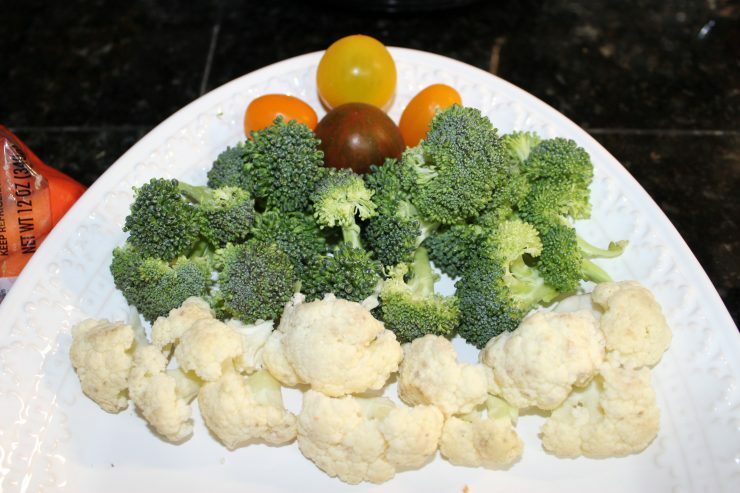 After adding the broccoli, add about 1 cup of cauliflower florets, also in a horizontal line. Continue adding your vegetables in a horizontal line, starting out in small amounts and gradually increasing the length of the line. Starting with short horizontal lines and gradually moving to longer lines creates that beautiful, Christmas tree shape. I have a little trick for slicing bell peppers that I wanted to share here. This will make the prep work for your Christmas Vegetable Tray so much easier! Start out by rinsing your bell pepper in cool water and slicing the top, stem area off. Once the top is removed from the bell pepper, cut in a circular motion around the seed and membrane area. This will allow you to easily remove the seed pod in one piece. 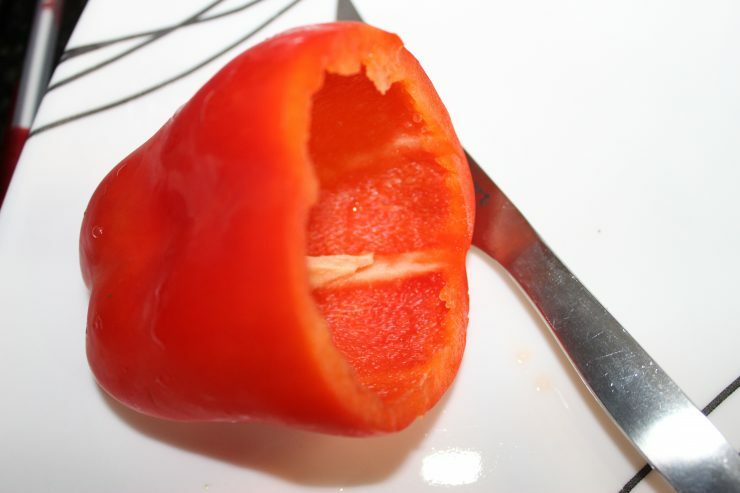 Slice the bell pepper in half and clear away any stray seeds or white membrane that might still remain. 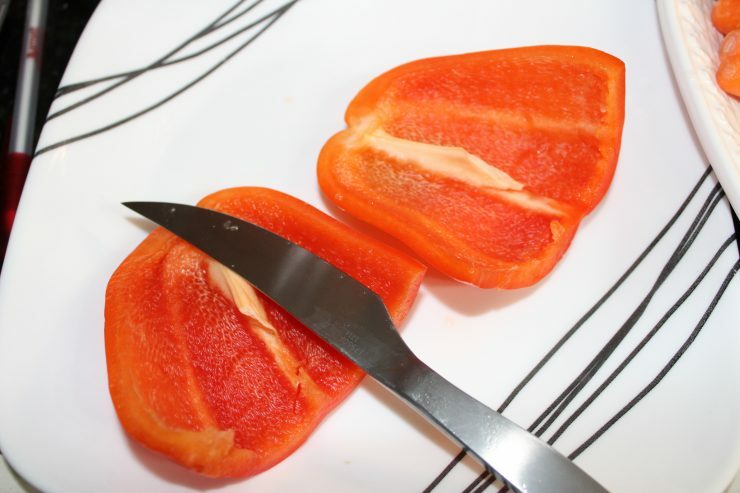 Now that your bell pepper is cleaned and seed-free, slice it vertically into long, thin slices. 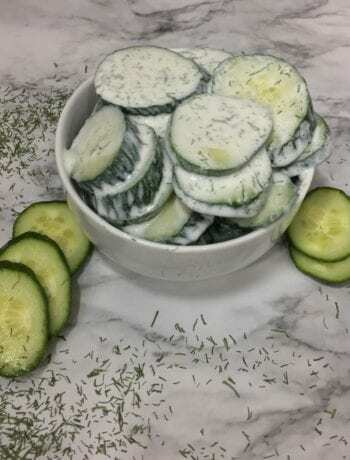 I’ve got another little trick up my sleeve for making cucumber slices pretty for your Vegetable Tray. I like to use long and thin English Cucumbers since they have smaller seeds and a mild flavor. Rinse the cucumber under cool water and remove both ends. Use a vegetable peeler to remove some of the peeling in long, thin strips. Be sure to only remove a portion of the peeling, leaving some remaining. This will create a neat, striped look, revealing two different shades of green. 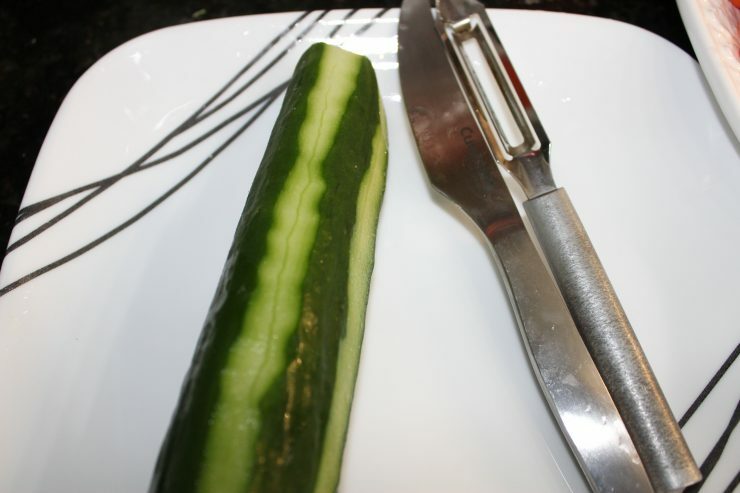 Now that the cucumber is ready to slice, cut the cucumber on the diagonal to create oval slices. 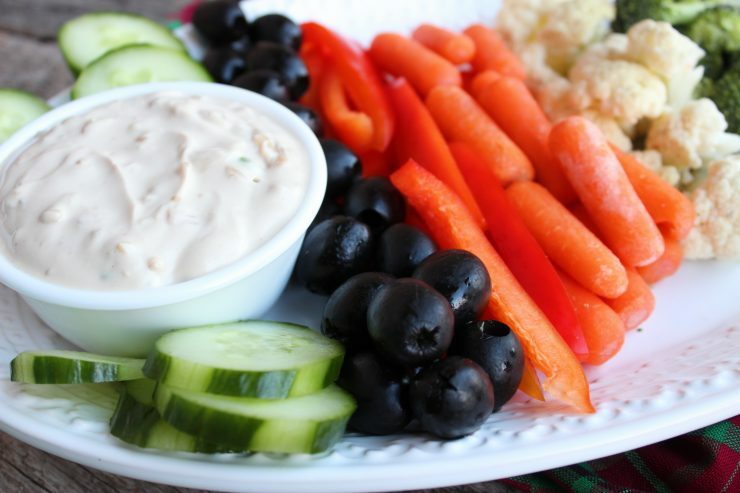 Making a delicious and creamy French Onion Dip Recipe for your vegetable tray is simple. 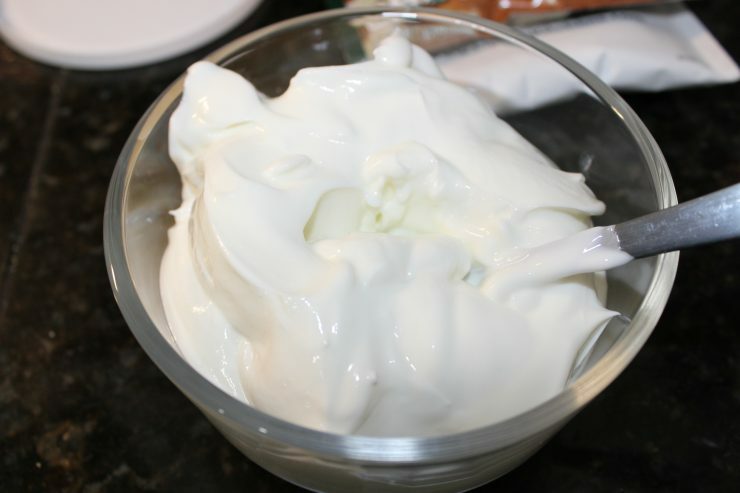 Add 1 cup of plain, nonfat Greek yogurt to a medium sized mixing bowl. 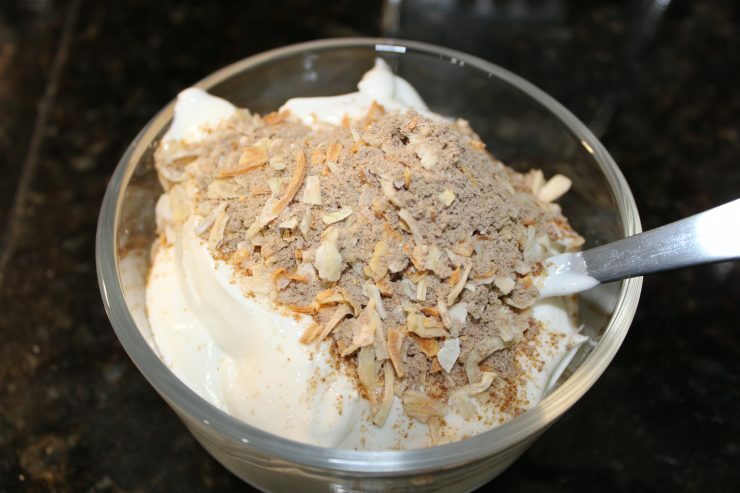 After adding your yogurt to the mixing bowl, add in 1 packet of dry, Onion Soup Mix. Stir the plain, Greek yogurt and the Onion Soup Mix together to combine, then add 1 tablespoon of Knorr Vegetable Recipe Mix. 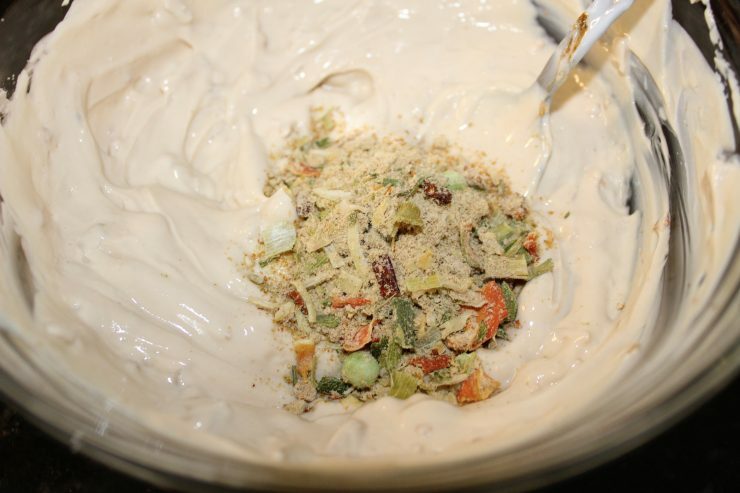 Stir the Knorr Vegetable Recipe Mix into the Greek yogurt and Onion Soup mix, then add in 1/2 cup of mayo. I suggest using Real Mayonnaise for this recipe and not fat-free or Miracle Whip. Stir the mayonnaise into the other ingredients until well combined. 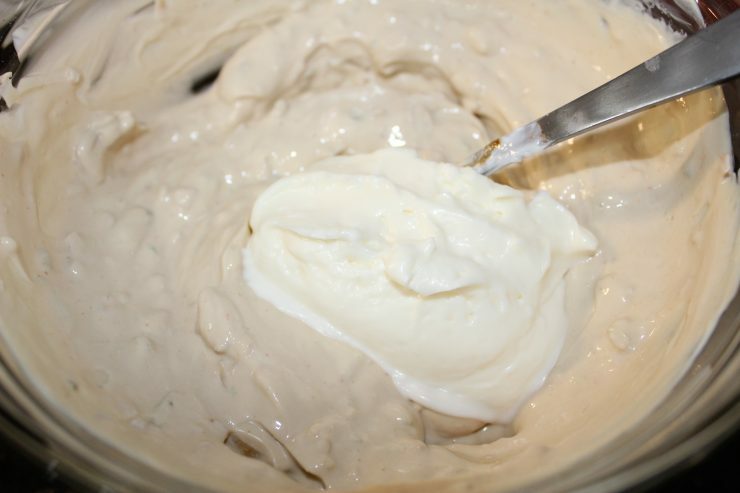 Cover this French Onion Dip and place it in the fridge to chill for 2 hours, or overnight. It’s important that you don’t skip this step – let those flavors blend and meld together! 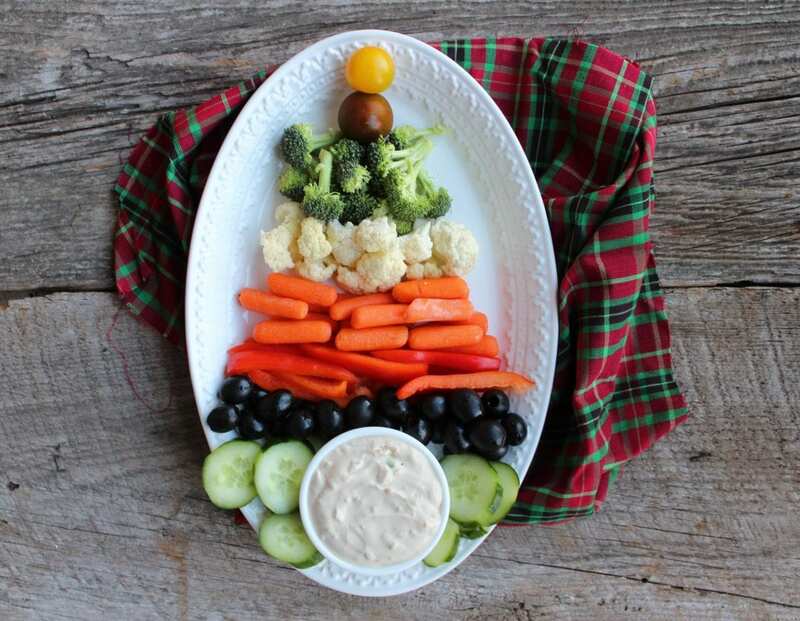 Once you have your vegetables arranged on a pretty platter to your liking, add a small bowl of the French Onion Dip or the Homemade Ranch Dressing to the bottom of the “tree”. The bowl of dip at the bottom of the Christmas Vegetable Tree makes up the “stump” of the tree. The Holiday’s are always a great time to have some fast and easy appetizer ideas in your back pocket. In order to help you better prepare for the Holidays, I wanted to share a few of my favorite appetizer recipes here. 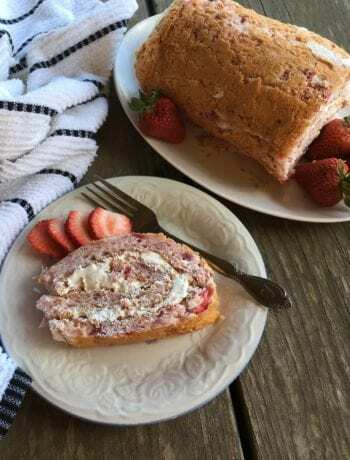 These Salmi-Babs by Soulfully Made are fun, fast, and easy – not to mention kid-friendly! I’m not sure if it gets anymore beautiful than this festive Cheese Board by Norine’s Nest. Such a perfect Cheese Board for any Holiday Party! This Southern Jezebel Sauce and Cream Cheese Appetizer by Julia’s Simply Southern will have your guests coming back for more – and asking to take a jar home! I hope you have enjoyed your time in my kitchen today and that you’ve come away with some great appetizer recipes to create this Holiday Season! 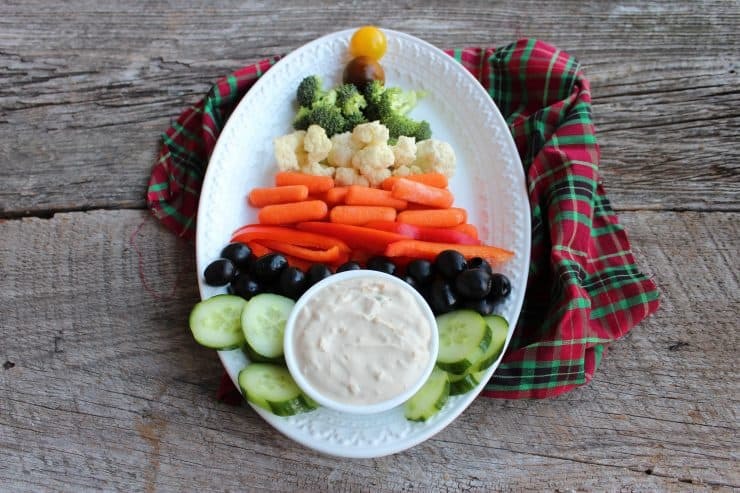 If you make my Christmas Vegetable Tray with French Onion Dip, please comment below with your thoughts! I sure love to hear from you! Here’s to wishing you a very Merry Christmas and a Happy and Prosperous New Year! 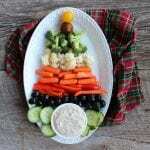 A simple and easy Christmas Tree Vegetable Tray with a homemade, creamy and delicious French Onion Dip. Perfect for your Christmas parties! Combine all ingredients in a medium sized mixing bowl and stir until well combined. Cover and place in the fridge to chill for 2 hours or overnight. Arrange the vegetables into a tree shape, starting out with the tomatoes on top placed vertically, followed by the broccoli placed in a horizontal line, cauliflower, carrots sticks, red bell pepper sticks, black olives, and the sliced cucumber arranged around the small bowl of French Onion Dip. The horizontal lines of vegetables should start short and gradually get longer to create a Christmas Tree shape. 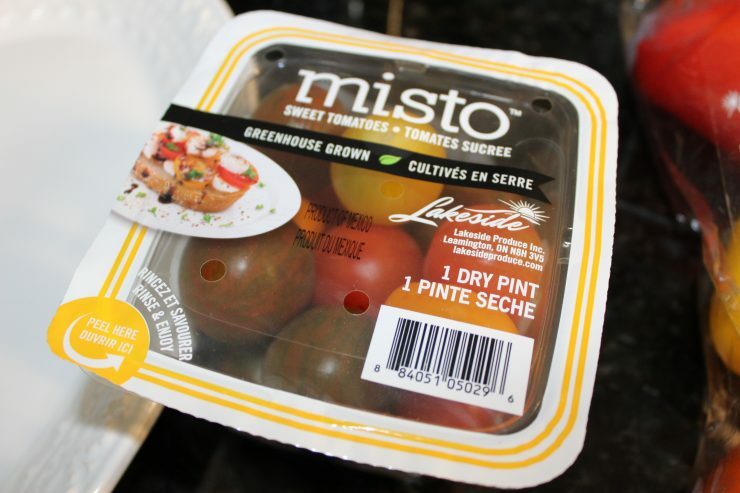 Serve immediately or cover with plastic wrap and store in the fridge for up to 24 hours before serving. PLEASE NOTE: The amount of vegetables given for this Christmas Vegetable Tray are to be used as a guide only! You may need more or less vegetables for your vegetable tray depending on how large or small it is. The important thing to remember is to arrange the vegetables with a vertical line on top (I used tomatoes for this) and then descending horizontal lines that start short and gradually become longer. This will give you that great, Christmas Tree shape. ALSO NOTE: You can use any vegetables you like for this vegetable tray. If you don't like some of the vegetables I used, replace them for vegetables you do like! Just keep it colorful! The serving size listed in this recipe is for the French Onion Dip. The servings for the Christmas Vegetable Tray will vary depending on how large your tray is and how many vegetables you are able to get on the tray. What a lovely presentation for your Vegetable Tray, just perfect for the season! Hope you are enjoying your week and thanks so much for sharing with us at Full Plate Thursday! Thanks so much! I have been making these for years every Christmas Eve and enjoy it so much. It’s just not Christmas without a good vegetable tray! This is SO cute! And, the best part is it looks pretty easy, too! Thank you! It is so simple and easy! Thank you so much for featuring my Christmas Vegetable Tray! We’ve all been sick around here so I have found myself behind in everything. 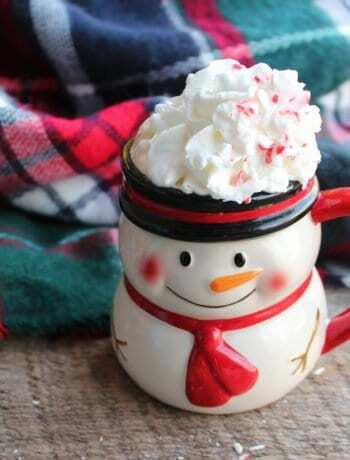 I hope you have a wonderful week and a very Merry Christmas!